Lucky..., a photo by monstrehero on Flickr. up now! What will you get?? MH is starting 2012 off with a bang. 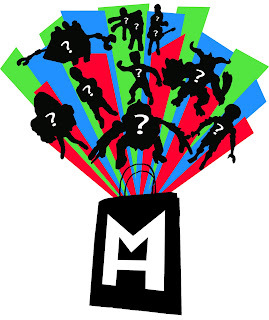 The Monstrehero 2012 LUCKY BAG features TONS of genuine MONSTREHERO goodness in one super-deluxe package (ie paper bag)! This is a LUCKY bag, so the contents are a mystery, but trust us when we say that every bag is a winner in one way or another. Almost every sculpt and character in the Monstrehero canon is represented, PLUS never-before-seen sculpts, unreleased colorways, prototypes, one-offs and art show pieces will be randomly included. This is a great jumping on point for new MH collectors and a fantastic supplement to any existing collection. ALSO, for the first time ever, we introduce MONSTRE-POINTS! These first issue one-of-a-kind coins feature the visage of one of our most near-and-dear creations, the venerable VICTIM #1, and will be redeemable for exclusive MONSTRE-SWAG in the future. 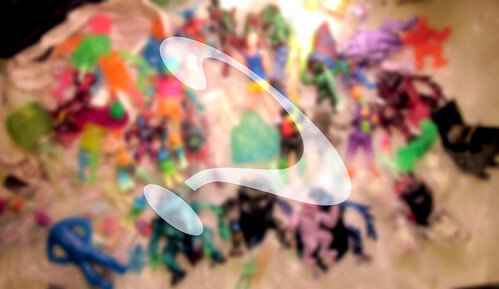 Each bag gets you at least THREE full-sized figures and an assortment of minis, smaller works, odds and ends, and more!